If happiness is hard to define in your 20s, 30s or 40s, imagine when you’re 60 or 70. That’s why Felicidário was created. 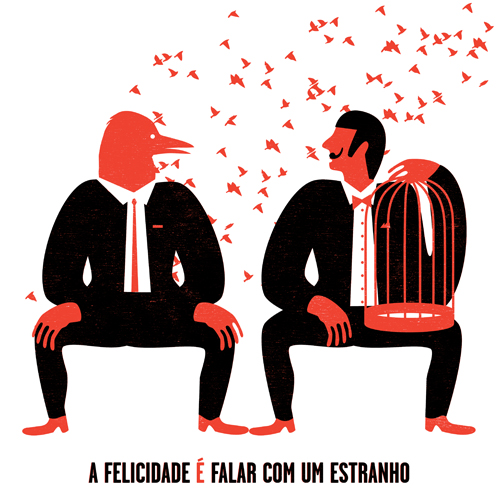 Felicidário is a calendar and a growing dictionary with 365 pratical definitions of happiness. When you’re 65 is happiness knitting a sweater, enjoying the dolce fare niente or is it doing things you’ve never done before? Every day for a year Felicidário will suggest a new definition of happiness for the elderly. Happiness has no age and is illustrated by me and all these greatly talented Portuguese artists Afonso Cruz, André Letria and Ricardo Henriques, Aka Corleone, Bernardo Carvalho, Carolina Celas, Irmão Lucia, Julio Dolbeth, Madalena Matoso, Maria Imaginário, Tiago Albuquerque and Yara Kono.